This post is sponsored by Simply Bags. Have you heard of Simply-Bags? If not, do I have a treat for you!! I adore personalized bags. I mean I really adore them! So when Simply-Bags contacted me and asked if I'd review their bags on my blog, I was more than happy to oblige. for the first time is Mr. One (my 9-year-old). It's so roomy! And cute to boot! (yes, I can rhyme.) I can't wait to use it at the pool this summer! But beach totes aren't the only bags you'll find at Simply-bags. Oh no! Check out these other beauties. Okay, so this one is a beach tote...but I couldn't resist the cute paisley design!! Love this quilted travel bag...and the monogram...so sophisticated! I've been really loving giraffe prints lately...this bag has my name written all over it. And this lunch tote looks pretty in damask. Makes brown-bagging it elegant, no? If you're in need of a bag - and really, who isn't? - hop on over and see their fabulous selection for yourself. You'll be glad you did. This post was sponsored by Simply Bags. The opinions expressed are 100% mine. Wendy. . . woot woo (that's my whistle). . . you look hot! 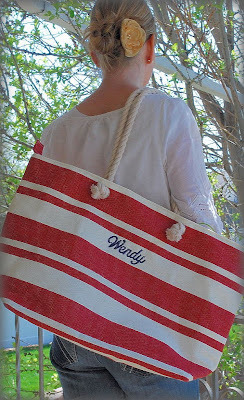 Oh my lands Wendy, I do not need another bag... but my want list just grew ten-fold! That beach tote jump screams "SUMMER"! And I love that giraffe bag - even though I am not into animal prints. These bags are super cute! That IS a cute bag, and your photographer did an admirable job. I love the damask lunch bag! I carry a toile pink and green lunch bag to work with me.